Dovetail Drawers - Drawer Connection Inc.
Dovetail Drawers: The dovetail joint is a common joint technique in dovetail drawer box construction that consists of a series of cuts that interlock to form a flat edge at the corners and sides and does not require glue or additional hardware to stay fastened. Drawer Connection does however, use glue on all joints. 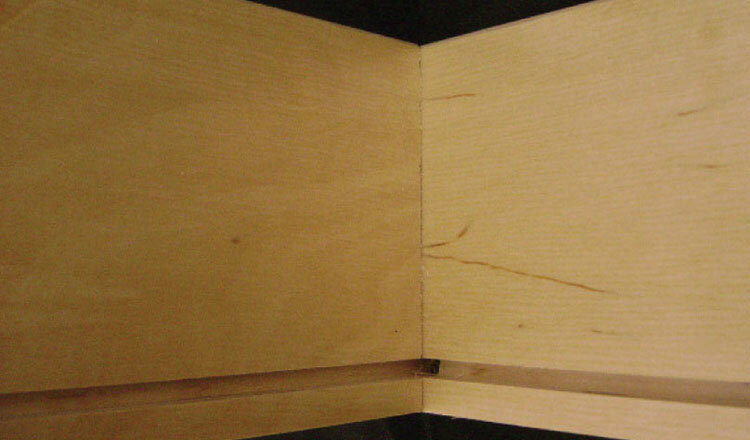 The dovetail joint is most commonly used to join the sides and front pieces of a drawer with no nails or screws showing through to mar the beauty of the drawer front. Modern machine tools make dovetail cuts easier and faster, for efficient manufacture and production of large or small orders with consistent precision. 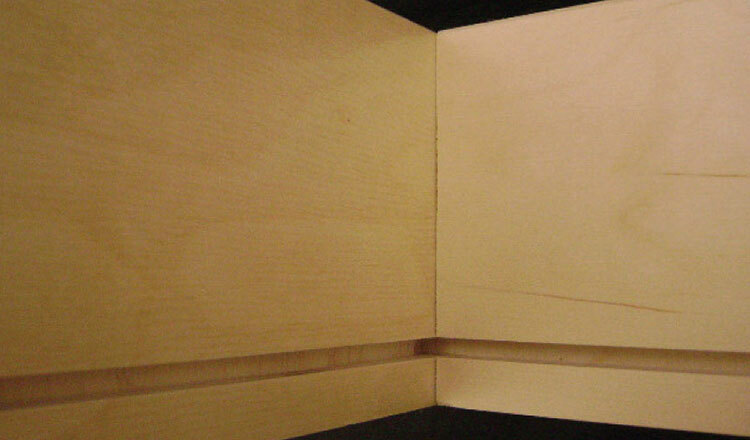 Drawer Connection uses wood such as maple, alder, finger jointed birch, oak and other solid species, as well as birch plywoods and melamines on MDF cores for all of our dovetail drawer boxes. 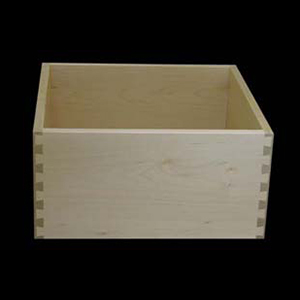 Drawer Connection can produce dovetail drawer boxes for custom design specifications on orders of any size. 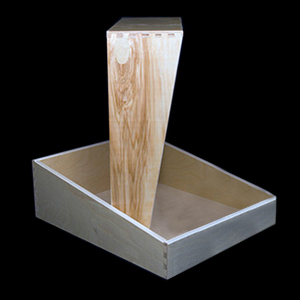 Dovetail corners offer an old world high quality look and feel at a price you can afford. 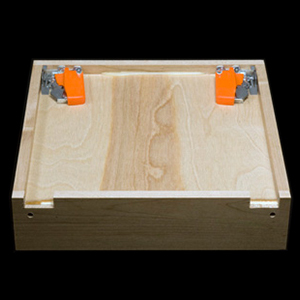 When you place your dovetail drawer box order you can customize with engraving, file drawers, angled drawers, drawer scoops, drawer dividers, smooth drawer glides, notching and drilling. We also offer in drawer power outlet and charging options. 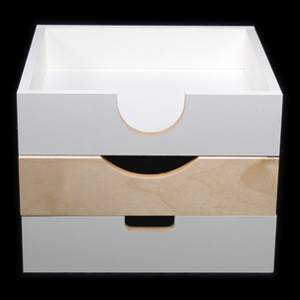 Drawer Connection offers your logo engraved in the front top right side of the inside of the drawer box. The laser will engrave on all materials. Your logo is a great marketing tool for your company. Drawer Connection offers three different choices. Scoops are used as an easier method to slide open a drawer box. 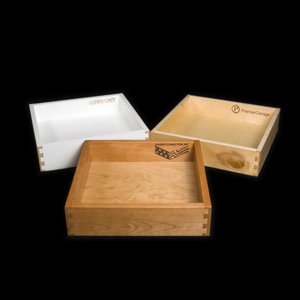 Drawer Connection, Inc offers three types of standard drawer scoops, they are applied on the center of the front of the box. Connection offers notching for file slots. 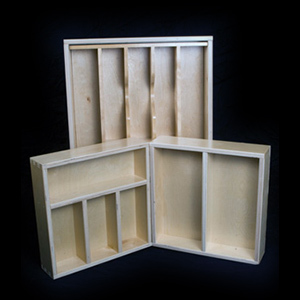 Drawer Connection offers dividers per customer specs. Drawer Connection offers under mount softclose drawer glides as well as full extension sidemount drawer glides. Ask represetative for details.